Takeaway: Copper is essential to the growth of plants. Among other things, it plays a part in several enzyme processes and is key to the formation of chlorophyll. Copper (Cu) is one of the micronutrients needed in very small quantities by plants. The normal range in the growing medium is 0.05-0.5 ppm, while in most tissues the normal range is between 3-10 ppm. In comparison, the ideal range for iron in the tissue is 20 times higher than that of copper. Although copper deficiencies or toxicities rarely occur, it is best to avoid either extreme as both can have a negative impact on crop growth and quality. Function of Copper: Copper activates some enzymes in plants which are involved in lignin synthesis and it is essential in several enzyme systems. It is also required in the process of photosynthesis, is essential in plant respiration and assists in plant metabolism of carbohydrates and proteins. Copper also serves to intensify flavor and color in vegetables and color in flowers. 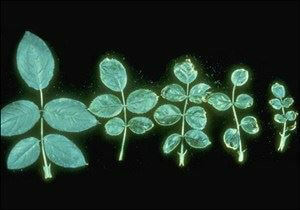 Deficiency: Copper is immobile, meaning its deficiency symptoms occur in the newer leaves. Symptoms vary depending on the crop. Typically, the symptoms start as cupping and a slight chlorosis of either the whole leaf or between the veins of the new leaves. Within the chlorotic areas of the leaf, small necrotic spots may form, especially on the leaf margins. As the symptoms progress, the newest leaves are smaller in size, lose their sheen and in some cases the leaves may wilt. The apical meristems may become necrotic and die, inhibiting the growth of lateral branches. Plants typically have a compact appearance as the stem length between the leaves shortens. Flower color is often lighter than normal. Excess potassium, phosphorus or other micronutrients can indirectly cause copper deficiency. Also if the pH of the growing medium is high, this can induce a copper deficiency as it is less available for plant uptake. Above: Normal rose leaf on the right in comparison to copper deficient leaves.Notice the smaller size, curling and chlorosis. Photo credit: University of Florida. 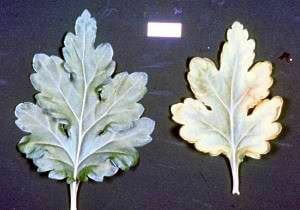 Above: Mum leaf on the left is normal while the one on the right has copper deficiency. Notice the leaf size and chlorosis. Toxicity: Excess copper in the growing medium can restrict root growth by burning the root tips and thereby causing excess lateral root growth. High levels of copper can compete with plant uptake of iron and sometimes molybdenum or zinc. The new growth can become initially greener than normal, then exhibit symptoms of iron deficiency or possibly other micronutrient deficiencies. If not corrected, copper toxicity can reduce branching and eventually plant decline follows. Copper, like most micronutrients is more available when the growing medium pH is low, so if copper toxicity is occurring, test the pH of the growing medium. Also certain fungicides have copper as their active ingredient, so it is essential to rinse the foliage off before testing the tissue. Legumes tend to be the most sensitive plants to copper toxicity. Where to Find Copper: Copper is provided entirely by most water soluble and controlled release fertilizers, as long as they are applied at recommended rates. Several fungicides have copper as heir active ingredient and some will be absorbed through the leaves. Irrigation water often provides some copper and in rare cases, it may provide excessive copper. Have the water tested to verify how much copper and other elements the water provides. If additional copper is needed, we recommend using a complete micronutrient fertilizer to avoid providing too much copper and inducing a deficiency of another micronutrient. A single element application of copper sulfate or a chelated form of copper can be used, but be cautius as there is a thin line between too little or too much copper. Apply the product as a drench and not as a foliar spray as it can scorch the foliage. For more information about fertilizer nutrients and their role in your crop production, please feel free to contact your Premier Tech Horticulture Grower Services representative.